As the city braces for another winter storm to batter the area, Abbotsford has implemented an extreme weather alert and closed all city parks until further notice. “All Parks Trails are closed until further notice due to current weather conditions and fallen trees,” reads a notice on the City of Abbotsford website. Fourteen centimetres of snow fell in the city on Sunday, with the mercury dipping to -8 C.
The city has been asking residents to prepare for strong arctic winds for a week now, while opening several additional shelter spaces for the homeless. A warning from Environment Canada says residents should expect blowing snow and that while the temperature will hit a high of around -3 C, gusting wind will push the wind chill to -10 C in the afternoon – raising the risk of frostbite to those outside. 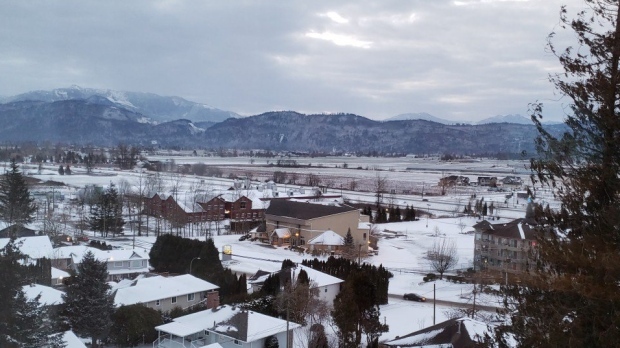 The snowfall warning in effect for the Fraser Valley, including Abbotsford and Chilliwack, forecasts another 10 to 15 cm. Mayor Henry Braun tweeted Monday morning to direct constituents to the city’s webpage outlining its snow removal priorities, which start with "…approximately 350 kilometers of all high volume and strategic arterial and collector roads which includes transit routes, school zones and major access to hillside areas." How does the @City_Abbotsford decide which roads to clear? The answer to this and other snow/ice-related #FAQs are here. All 46 schools in the district remain open today, with full bus service scheduled to run throughout the day.